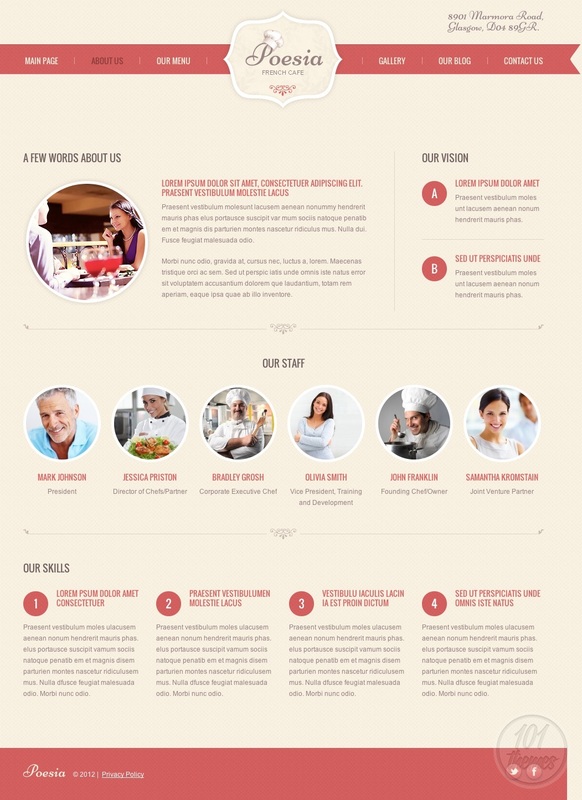 If you need a WordPress restaurant theme or a WordPress cafe theme, you can find both in this one single template called Poesia. 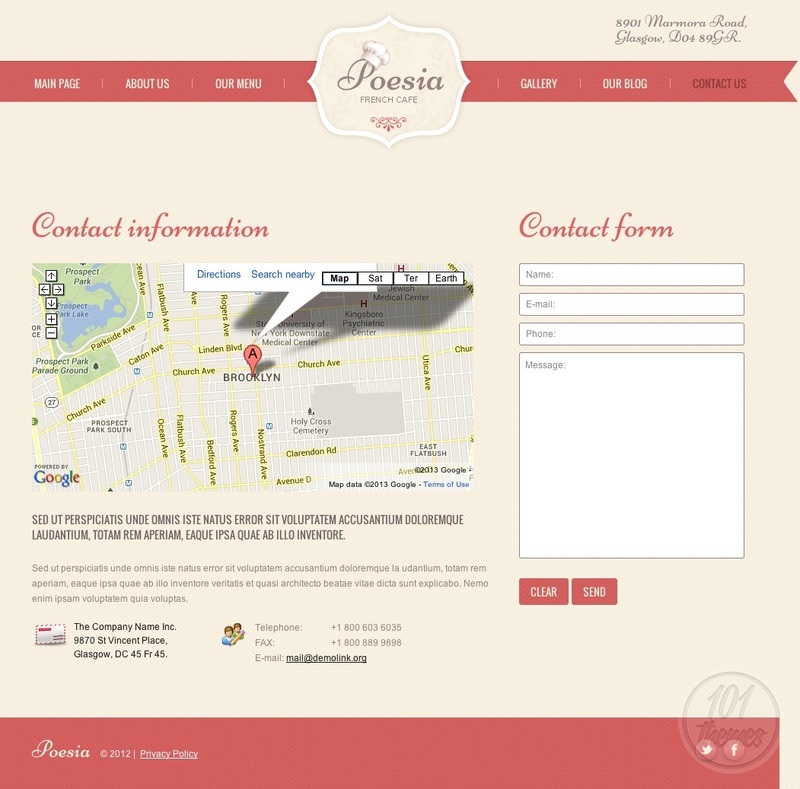 Poesia featured at Template Monster and it was created by the developer Hinoriko. 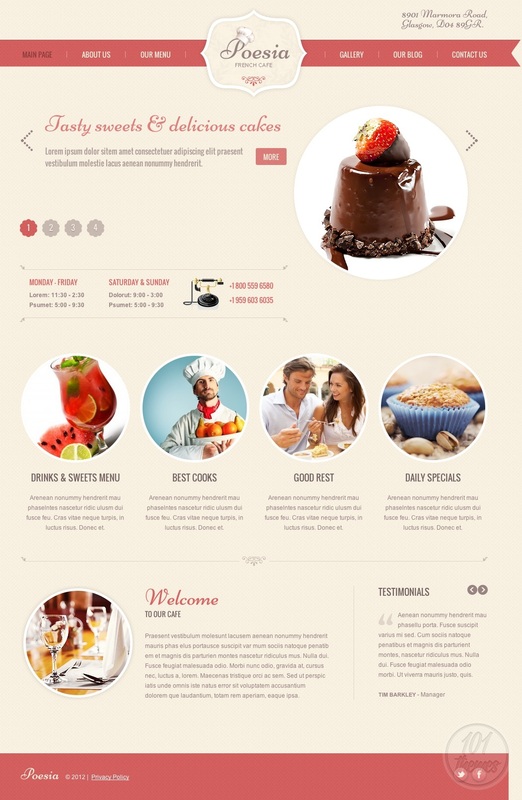 This is a theme with a beautiful layout that has a charming set of colors: white, red and light blue, with the white prevailing. 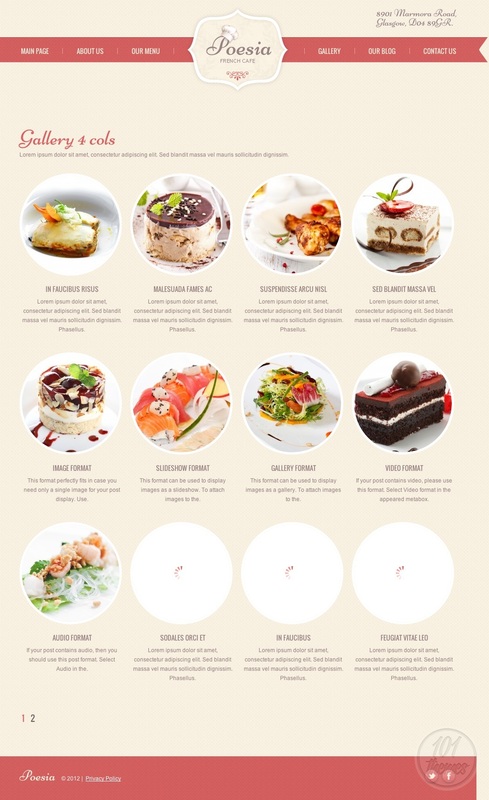 The homepage features a creative slider with nice photos of delicious specialties shown along with some info text on the dishes presented. It is clear that you can use it to impress your visitors and catch their attention right away with all the mouthwatering photos of your delicious food. You can add your working hours to your homepage, and also a sneak a peek of your chosen posts, along with photos and a short version of the post, just to tingle the visitor’s interest. By clicking these teaser posts, they will be lead to pages with full content. 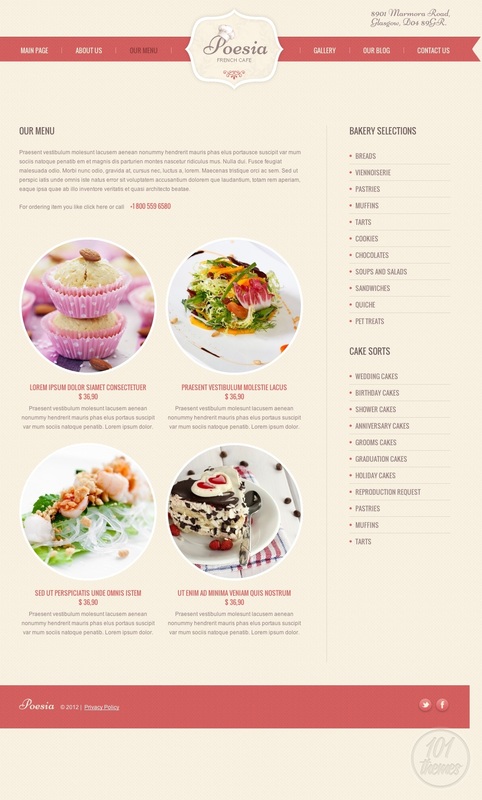 The theme features a blog section where you can post as much as you want and create various kinds of posts. The “about us” section is reserved for putting links to your archive posts, FAQs and testimonials. 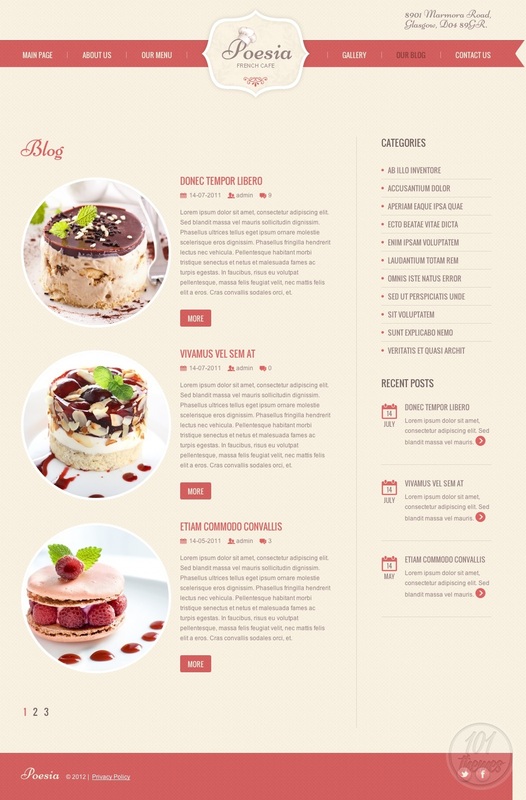 You can easily create a great looking menu and categorize it so your visitors know exactly where to look when they are looking for a certain kind of dish on your website. The gallery area is there to help you create pretty galleries and you get to choose whether you want them to be 1 column, 2,3 or 4 column galleries. Connecting with social networks is always a plus, and this theme offers the possibility of integrating with Facebook and Twitter. Poesia features a great, functional admin panel. It is fully widgetized and comes with PSD files included. 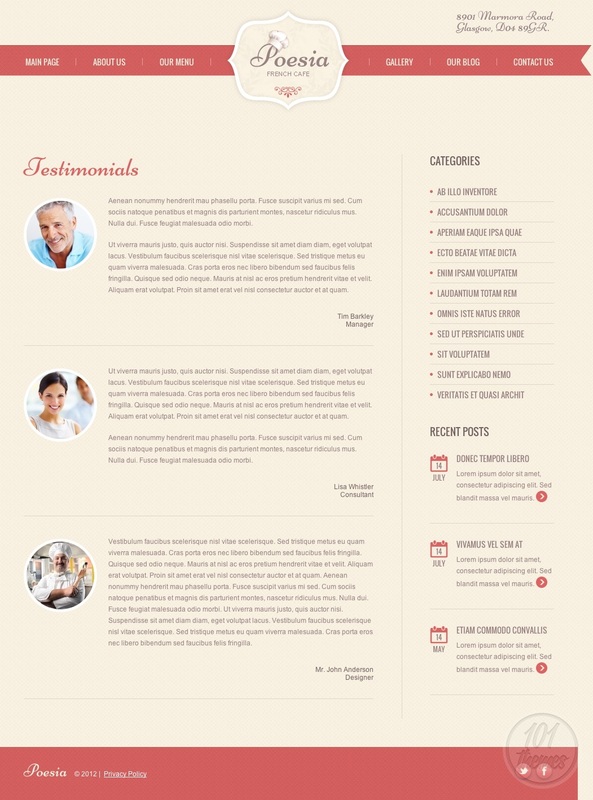 There are several ways of purchasing the Poesia theme; apart from the regular theme purchase you can also choose some of the nicely put together bundles Template Monster offers.